This was before some ravioli exploded, so it's the prettiest shot. I don't know about you, but life doesn't slow down during the winter holiday season. Far from it! 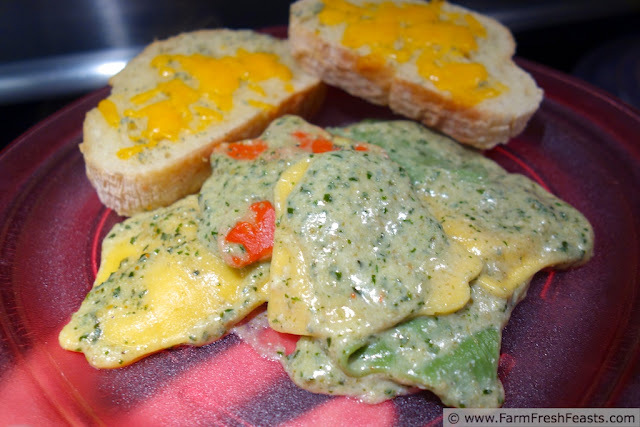 So I'm always looking for quick meals to put on the table utilizing the produce I've put up earlier in the season. A fun way to get in your carbo-loading for your all night gift wrapping or card-addressing or cookie-baking marathons (or the Jingle Bell Run or an actual marathon if you're into that sort of thing) is this fun shaped and filled pasta. I get it at Costco but have seen it in other stores. 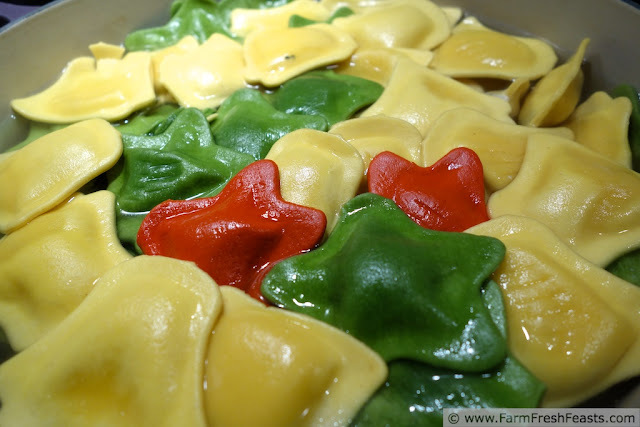 I fixed my loved ones red heart-shaped cheese ravioli for Valentines day, and when I saw this green, red, and white star- and bell-shaped I knew it would be a big hit. When I hit the grocery store I cruise the perimeter looking for marked down stuff: mushrooms and bananas in the produce section, milk in the organic section, day old bread in the bread section, fancy cheese in the fancy cheese section, and if I'm wanting it, I cruise past the prepared foods section looking for Alfredo sauce. More often than not, I'll find a container marked down. Then I know I'll be fixing up a quick pasta dish like this, or using it on a pizza like this, or for tonight's meal. If I don't find any, I'll check back later in the week--the kids drink milk like calves--so I just rearrange the meal plan. Snort. Like there's a plan. One of the reasons I put up stuff when I've got it is for nights like this--I can come home and toss together a fast meal with some wholesome ingredients in a flash. 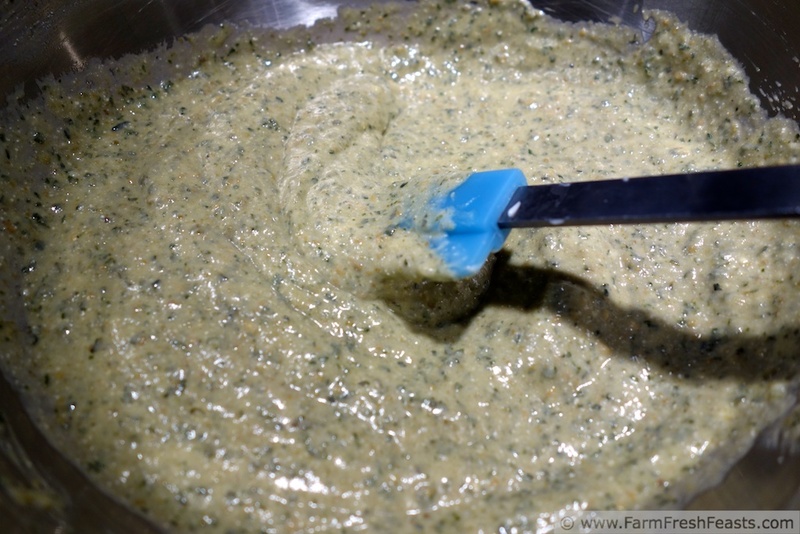 If you're using your pesto stash, toss 3 cubes of your frozen pesto into a bowl to thaw. Preheat oven to 375 degrees Fahrenheit and a pretty purple pot of salted water over high heat. 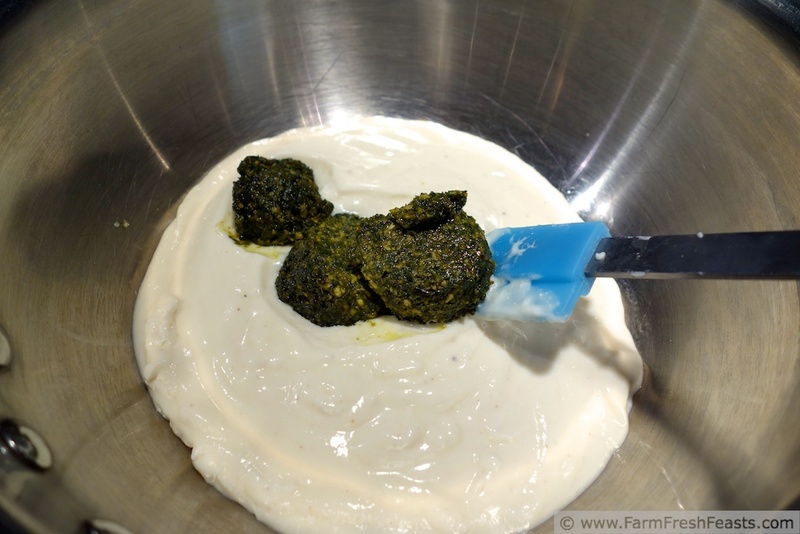 In a large saucepan (you're going to add the pasta to this pan), gently warm the Alfredo sauce over medium-low heat. Toss in the pesto once it's mushy enough to stir into the sauce. When the water is ready, throw place the ravioli gently into it and stir to keep it from sticking to the bottom. Cook according to package directions, drain, and add to the sauce. 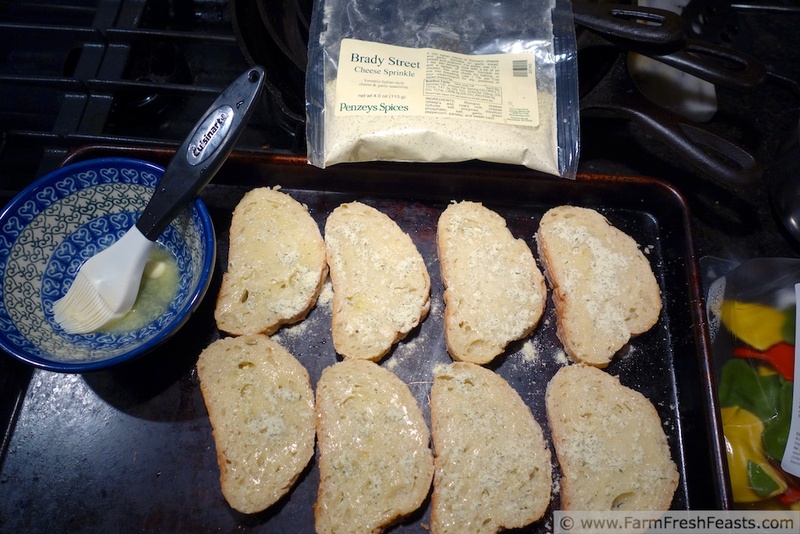 Stir gently, but if a few ravioli explode it's OK.
Slice the leftover day-old Italian bread into 1 inch thick slices. Brush with melted butter. Sprinkle (get it? sprinkle?) Cheese Sprinkle over the buttered bread. Top with whatever leftover shredded cheese your son prepped (tonight--sharp cheddar). 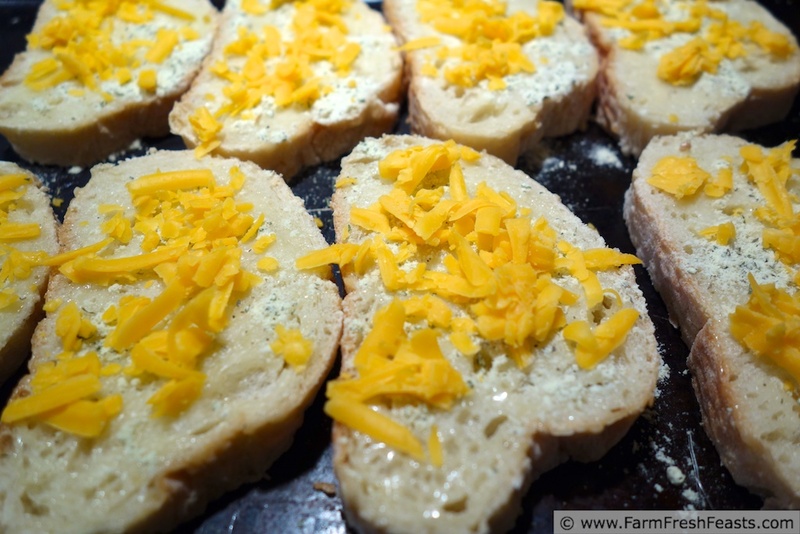 Bake for 5-8 minutes until cheese is melted. Carbo-loaded and ready to tackle the next project!